Page Street Publishing, 9781624147548, 176pp. Flavor-forward, fuss-free meals come together effortlessly with this indispensable guide to creating restaurant-quality dishes with your multi-cooker. From Lemon-Paprika Smothered Pork Chops to Lobster Fettuccini, each fresh and time-saving recipe in this versatile collection requires just 15 minutes or less of prep work, so you can enjoy satisfying, gourmet flavors on even the busiest weeknights. The variety of options for both pressure cooking and slow cooking offers a solution for every occasion, whether you need dinner in an instant or want to prep it and forget it. Let Turkey Egg Roll Meatballs slowly simmer on a lazy afternoon, or whip up some Tex-Mex Chorizo Chilaquiles in a fraction of the time. Impress guests with Balsamic Burst Tomato & Basil Bucatini, or dig into a comforting plate of Bourbon Pot Roast Nachos. 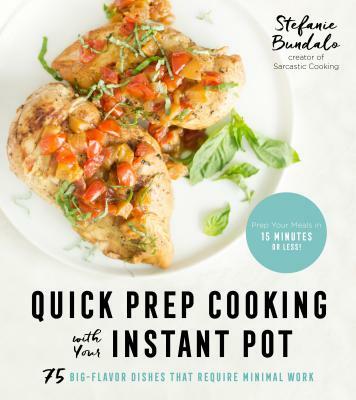 With step-by-step instructions and packed with easy, approachable recipes for meats, pastas, soups, sides and staples, Quick Prep Cooking with Your Instant Pot® makes mealtime foolproof, hassle-free and fun. Stefanie Bundalo is the founder of Sarcastic Cooking. Her recipes have been featured on Self.com, and she’s worked with a number of liquor companies such as Wave Vodka and Buffalo Trace Distillery to produce recipes that highlight their products. She lives in the Chicago area with her husband and children.